Just a little tidbit of humor with our NYC trip. We left super early and as we walked to Sloan we joked about how early we were going to be. We noticed a few marching bands milling around the streets but still did not make the connection -- Columbus Day. Before we knew it, our path to the clinic was blocked by a parade. It took us an hour to work our way around it (no one seemed to know the path the parade was taking). We came upon Gov. Andrew Cuomo working the crowd -- he was chewing gum. 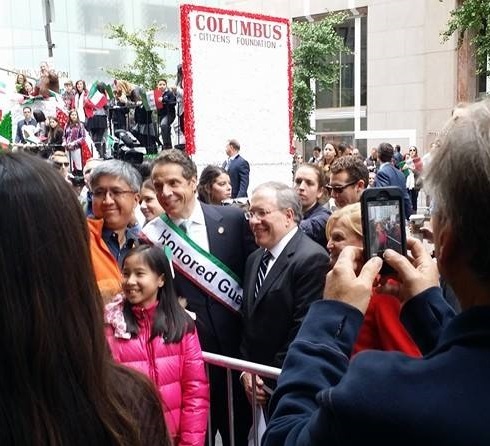 Meanwhile a recording blared "ANdrew CUOmo, friend of Italian Americans!" We heard that goofy recording over and over as we tried to get ahead of the path of the parade. It felt very strange. I did snap a photo.